The Louisville Slugger Ultimate Pitching Machine also known as the UPM 45 is the best pitching machine I have seen in 27 years of coaching. A key benefit for Coach Pitch Leagues is that the machine will throw the ball 30 mph with consistent accuracy. It is so simple that when people see it on the field they buy it on the spot. It is made out of steel and is durable. 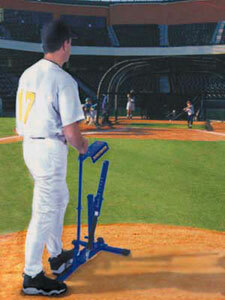 This pitching machine will make coaches and players enjoy the game much more. Its convenience and accuracy are second to none. It weighs less than the extension cords needed for electric wheel machines. 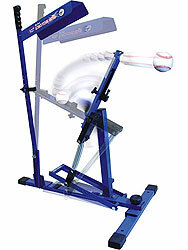 The Ultimate pitching machine will help coach pitch games go faster and be fairer to the players. Everyone knows how hard it is to throw a strike to a 4 foot tall player. You will no longer see a coach down on one knee trying to throw a strike to a batter. This pitching machine does the job. It lays consistent strikes right down the plate. It can throw a baseball as slow a 18 mph and any speed from there to 45 mph. You pick the speed setting. Players crush the ball and mothers love it. The Ultimate Pitching Machine was designed to give you extra hitting time between your practices & games and is perfect for the travel team that does not want to haul a heavy motorized machine. Its light weight makes it extremely portable and no electricity is required. 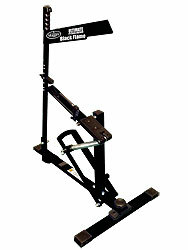 This is a great pitching machine that player of all levels can use. The Ultimate is the most affordable real-baseball throwing machine that we have ever tested and can throw ANY type of ball. It will throw a softball from 35 feet at speeds from 18 mph to the 40-43 MPH range. It throws ultra lite softball about 60 mph and an ultra lite baseball near 70 mph. It will throw wiffle balls. It can also throw a consistent 10 to 12 foot arch softball slow pitch. The Ultimate Pitching Machine is Little League-approved and hundreds of leagues, including Dizzy Dean and Dixie, have changed their rules, making the Ultimate mandatory to use in Coach's Pitch games in place of the coach attempting to throw strikes.